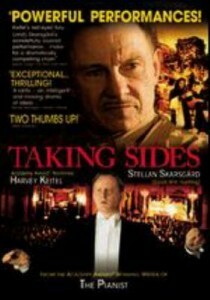 Based on the life of Wilhelm Furtwangler, conductor of the Berlin Philharmonic, Taking Sides examines Furtwangler’s role during the Nazi era. Was he a collaborator as hard-nosed U.S. Major Arnold sets out to prove? Or was he an artist who walked a tightrope as he tried to keep his music separate from politics? This entry was posted in Mary K. and tagged drama, movie, war on July 31, 2015 by jamiea.